Original art by Luke McDonnell from WWU #3. Ink on two 11 x 17 DC Comics' artboards taped together. Red marker lines form Boomerang cigarette & Duchess gun smoke. Some slight yellowing of paper around edges. 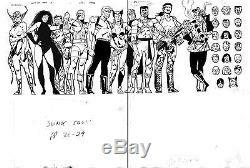 The item "SUICIDE SQUAD/ WHO'S WHO UPDATE'88 Vol 1 #3 pp 28-29/ McDonnell/ DC Comics 1988" is in sale since Friday, August 05, 2016. This item is in the category "Collectibles\Comics\Original Comic Art\Interior Pages". The seller is "914luke" and is located in Albany, New York. This item can be shipped to United States, to Canada, to United Kingdom, DK, RO, SK, BG, CZ, FI, HU, LV, LT, MT, EE, to Australia, GR, PT, CY, SI, to Japan, to China, SE, KR, ID, to Taiwan, ZA, TH, to Belgium, to France, to Hong Kong, to Ireland, to Netherlands, PL, to Spain, to Italy, to Germany, to Austria, RU, IL, to Mexico, to New Zealand, SG, to Switzerland, NO, SA, UA, AE, QA, KW, BH, HR, MY, BR, CL, CO, CR, PA, TT, GT, SV, HN, JM.